The Ballynolan thistle brooch was found near Pallaskenry, Co. Limerick in 1836. It was discovered by John Kennedy as he cleared stones from the fields near his home. On turning over a particularly large boulder, the ground was disturbed and the brooch emerged from its hiding place. Fashioned out of silver, it remains a mystery why this valuable item was concealed beneath a rock nearly 1,000 years ago, or why its owner never retrieved it. 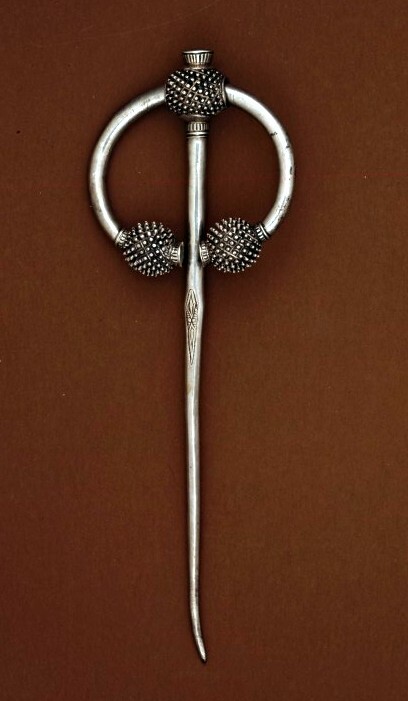 It represents a type of Early Medieval pin, which is named after the distinctive thistle-head like motifs which adorn its terminals. These brooches appear to have developed in Ireland and then quickly spread throughout the Viking world. Normally made of silver, they are found in Ireland and Scandinavia as well as the parts of England and Scotland where the Vikings were particularly active. The brooches were used to fastened cloaks and other garments and would have been a conspicuous display of the owner’s wealth and status. They typically date from the 9th to 11th centuries AD and are a continuation of the Irish penannular brooch tradition of the preceding centuries. In North Munster at least six of these pins have been discovered, with notable examples including brooches from Ardagh, Co. Limerick and Cashel, Co. Tipperary.